General Bernanke has declared The War and this war is not against Terror to distract the subjects and profit from it, but against the Almighty US Dollar. Fight will be brutal and no prisoners will be taken. We Commonsense soldiers at this blog, our Gold and Silver positions are strongly supporting him and warning everybody not to fight the FED! So far run from the US dollar was marginal, but everybody should understand that in places like Russia or China intention means order if told by the right person. Now we have Venezuela and Russia, before Russia and China were discussing to put trade beween them in local currencies. Small scale for sure before China will confirm it, but what about all those move out of US Dollar reserves? What will happen if Russia will switch to Euro in its Gas trade with Europe? Now we have all commodities priced to perfection - End the World perfection, but what will happen if decoupling is not dead and China will make it? Anything in expansion above 8 percent will be total surprise to the Wall Street Doom Sayers. All trillions pumped into the system will find its way out into the Supply/Demand situation for resources. With continued Demand, Supply side will be not able to deliver if commodities will stay at this level: it is self correcting situation. Production is cut, mines are closing, nobody drilling any more. Where China will take the goods? In emerging markets like south America and in old Canada and Australia as well. Just check the news on China building influence over South America and Africa. reaction in Gold, Silver and Base metals will be very interesting this week after recent announcements from China. "Nov. 30 (Bloomberg) -- China’s economy may grow 10 percent next year as the “huge” potential of domestic consumption and investments counters the impact of a global slowdown, a State Council researcher said. Price of Bailouts - US Dollar collapse. Jim Sinclair has nailed it. $8.5 trillion is unthinkable in terms of paying back the depreciated value of financial and non financial business entity portfolios. Assume someone came to your door and asked you how your investments were going. 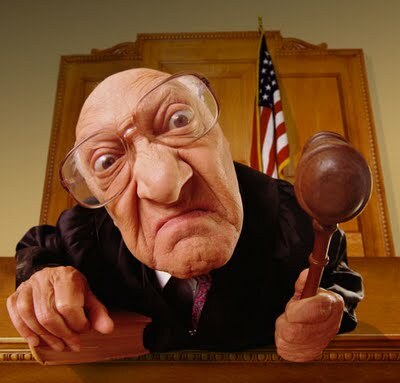 When you explain to that person that a bad man in Toronto organized a group of really nasty people named hedge funds to naked short your shares and as a result you have lost 90% of your retirement fund, that person hands you a check to cover your loss. Would you then characterize the money from that check as neutralized funds only filling a black hole in your balance sheet having no real economic impact on you? That opinion, held by many, is so academic. The idea that $8.5 means nothing because it fills some black hole of losses is "form" over "substance" and simply too academic to believe. This is $8.5 trillion! Now with that thought in mind contemplate $8.5 trillion dollars (for starters) before President Elect Obama’s fiscal stimulation for the creation of 2.5 million jobs, then a condition called, "Out of Control." It is very important that recent break out to the upside in Gold price is confirmed by move Up in Gold Miners GDX, HUI, XAU. Chart is looking very strong: MA50 was overtaken on one breath. Rising appetite for equities is multiplied here with rising Gold price. Sector is so small, all miners GDX cap being around One Hundred Billion dollars, that money inflow could quickly bring it back above MA 200 when Technicals will confirm Bull is alive in this market. Silver was thrown in the towel in recent markets collapse, ratio Gold to Silver is at multi year High, you can not buy any physical in meaningful amount at spot price. Planes from London are literally flying Silver into India. 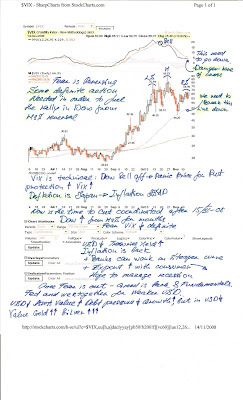 Gold is a Call on Inflation and debasing US Dollar in QE, Silver is a Call on rising Gold. Coming move in Silver will be explosive if Gold will close above MA200. Should US Dollar confirm its breakdown as we discussed before, Gold will have a rally above MA200 which will bring new confirmation that this Bull is very much alive. Auto bailout, Obama's stimulus plan and any confirmation about Chinese buying gold will send it to new highs. US Dollar is name of the game now. Inflation is the most desired outcome for the FED. Deflation death spiral with self reinforcing margin calls selling and US Dollar going higher is the lost decade Japan style. We have near Zero rate policy, more then 7 trillion dollars allocated to bailouts, coming auto bailout and Obama's stimulus plan. Slogan of the day is Reinflate and save economy and we will deal with Budget at later stage. On US Dollar Supply side we have almost 2 trillion deficit next year to be financed by Debt sales, ballooning FED balance sheet with low quality assets nobody wants and Quantitative Easing when FED is issuing new money by way of buying Treasuries and other Debt instruments. Expending monetary base is Inflation. QE in recession when products and services GDP are going down in value means more money are chasing less goods - money US Dollar is losing its value. Weaker dollar is stimulating export, inflating out debts. QE is reducing rates for mortgages supporting consumer and its ability to spend. 1. Chinese stimulus plan which means that reserves which are held so far mostly in US Dollars will be spend on Infrastructure developments and creating Internal Demand for goods and services. It means buying less or even selling treasuries. 2. Diversification of reserves into Gold to buy almost one year worth of world Gold production. It means selling treasuries. Please note important coincedence: China rumored about Buying Gold and QE started to be apparent with CitiGroup bailout. Treasury is desperate to bring yields as low as possible to be able to sell treasuries to finance this year deficit before Chinese structural shifts will be apparent to the market and put pressure on dollar and bring rising Yields in bursting Treasury Bubble. 3. Very important recent development when China announces about possibility to buy base metals as state reserves. This is what we need to bring inflation back - put a solid floor under commodities prices. Chinese do realise that QE is in a full play now and what it means in the medium term 3-5 years: much higher prices for commodities. They need to secure Supply of commodities to make its stimulus plan work. They need to prevent further supply distraction with falling prices when mines are shut and projects are put on the shelves which means even higher prices for China in the future. It means selling treasuries again and investing in Hard Assets. You can read on QE and Gold relationship during Japan reinflation efforts here. Fear Index VIX is making definite break down from recent highs, panic is subsiding and Greed and chasing performance is coming back. 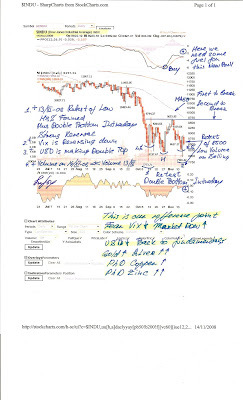 Distorted picture of Value with Panic and Forced liquidation is changing to fundamentals and value in solid assets with clear Demand and Supply economics. After CitiGroup C bailout Fear VIX has diminished and is on track to subside and be taken over by Greed and chasing performance. Bubble in treasuries is reinforced by Quantitative Easing when money are printed and FED is buying Treasuries and other debt instruments. Rebalancing is pushing funds to sell low Yielding Treasuries and buy Equities after recent collapse. Bailout of autos GM and F in any form will bring more fuel to this rally. Like we have discussed shorts were served Fried this week. Rising gold, China stimulus and risk appetite are moving Canada into Rally from recent low. Record low yield on Treasuries are pushing money into chasing performance again. 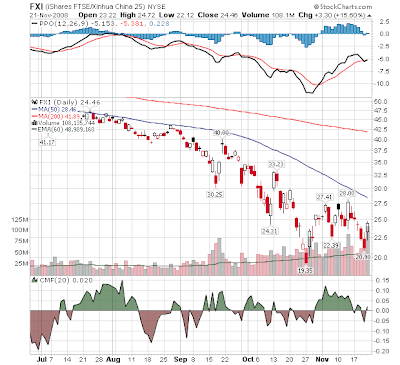 Recent announcement about China stockpiling commodities on Friday coincide with 5.9% in index and move above 50 MA. With all this volatility and Gloom and Doom everywhere so easy to forget the big picture: Gold is up during the November 61 dollars or 8.1% to 816.3 and what is more important up year on year 2%. Has Gold overcome finally spell of Forced Selling - we will check the charts later. NEW YORK (MarketWatch) -- Gold futures edged higher Friday in light trading following the Thanksgiving Day holiday, rising for a fourth straight week and ending the month with their biggest monthly gain in nine years. Gold for December delivery rose $7.70, or 1%, to close at $816.20 an ounce on the Comex division of the New York Mercantile Exchange. It rose 3.1% this week. In the month, gold advanced 14%, the biggest percentage gain since September 1999. November's gain followed gold's slump in the previous month. The metal fell 18% in October, the biggest monthly loss since February, 1983. Gold rose "on safe-haven demand and on the likelihood of further dollar declines with further reductions in U.S. and international interest rates," said Mark O'Byrne, executive director at Gold and Silver Investments. In gold spot trading, the London gold-fixing price -- used as a benchmark for gold for immediate delivery -- stood at $814.50 an ounce Friday afternoon, up 50 cents from Thursday afternoon. Holdings in the SPDR Gold Trust, the largest gold exchange-traded fund, stood at 755.06 tons on Tuesday, unchanged for a third day, according to the latest data from the fund. The SPDR Gold GLD 80.31, -0.07, -0.1%) rose 0.3% to $80.61." Clever, clever guys are buying Gold and now Base metals for reserves. All those Trillions from bailout are going to spill over into the world making US Dollar worthless and igniting new chase for Value and Resources for sustained growth. HONG KONG, Nov 28 (Reuters) - China is looking at buying base metals as state or commercial reserves to take advantage of the lowest prices for years and bolster weak demand, industry sources said on Friday. They said Beijing may be considering at least two proposals -- one for all base metals and another just for copper and aluminium. The metals could be purchased by the State Reserve Bureau (SRB) or commercial entities controlled by the government. "The proposal was for all base metals," an analyst at a state research unit said, without giving details.But a senior executive at a large aluminium smelter said the Ministry of Industry and Information Technology had proposed the government increase state copper and aluminium reserves. He did not provide proposed tonnages or timing.A sales manager at an aluminium smelter said he had heard that the proposal advocated the government use 20-30 billion yuan ($2.93 billion-$4.39 billion) to buy up base metals for its reserves.If it goes ahead with purchases, the world's top consumer of copper and aluminium could end up importing more refined copper and nickel and cutting into domestic stocks of aluminium, lead, zinc and tin.Prices of base metals have slumped since July on weakening demand, with the losses accelerating over the past few weeks due to the global economic crisis and China's own slowdown, forcing metals smelters to slow production and cut jobs.Beijing, keen to help strengthen smelters as it looks to bolster the economy, is changing a long-established policy of restricting expansion in the resource-intensive metals industry.China's cabinet, the State Council, is planning to step up purchases of important materials and resources for its state and commercial reserves, the government said in a statement this week, without specifying. "I think there is a good chance that the SRB will buy copper, given the current price ratios between the LME and Shanghai, and low domestic stocks," said Liang Zhigang, analyst at Minmetals StarFutures in Shenzhen.He said the SRB might buy at least 400,000 tonnes, about one month's consumption in China, as the first step, if the government approved the stock-building plan.That amount of copper would cost China $1.464 billion at Friday's prices.Industry sources said they had not seen signs of SRB buying copper in the domestic market, while aluminium reserve purchases could come soon.The buying of aluminium reserves may have been approved by the government, which would benefit Chinalco, the parent of Aluminum Corp of China Ltd, China's top producer, industry sources said on Friday.The government might ask state-owned investment arms to buy up to 1 million tonnes of aluminium from state-owned smelters between December and June next year in stages, a smelter source said.Analysts and industry sources said purchases could push up copper prices, while aluminium prices could have a short-lived rise, given the huge stocks in the domestic market and China's persistent surplus.China's merchants and smelters, including state-owned Chinalco, held a total of more than 1 million tonnes of aluminium at warehouses and smelters' yards, about one month's output.Last week, Wen Xianjun, head of the aluminium division at the state-funded China Nonferrous Metals Industry Association, also told Reuters the industry body had suggested the government buy aluminium for the state reserves. You do not need any enemies with such friends as Hank and Ben. Quantitative Easing is the name of the game now and US Dollar will suffer like a Yen during the same medicine in Japan. But it is the only medicine to by some time and get out of Deflation spiral, Inflation is the answer to all debts to be fading away with value of money. ...The long-term risks are enormous but difficult to estimate. They begin with the danger of a new surge of inflation, at least after the economy comes out of its current downturn. Beyond that, taxpayers will have to pick up the losses from loans that default or guarantees that have to be made good. ...To bolster the general economy, it relied on its traditional tool: reducing the overnight Federal funds rate, the interest rate that banks charge for lending their reserves to one another. Normally, a lower Federal funds rates leads to lower long-term rates, like those for mortgages. The move amounts to what economists refer to as “quantitative easing,” which means having the Fed pump staggering amounts of money into the economy by buying up a wide range of debt instruments..."
"Gold is poised for a dramatic surge and could blast through $2,000 an ounce by the end of next year as central banks flood the world's monetary system with liquidity, according to an internal client note from the US bank Citigroup. The bank said the damage caused by the financial excesses of the last quarter century was forcing the world's authorities to take steps that had never been tried before. ...Gold traders are playing close attention to reports from Beijing that the China is thinking of boosting its gold reserves from 600 tonnes to nearer 4,000 tonnes to diversify away from paper currencies. "If true, this is a very material change," he said." Silver needs to confirm its breakout from downtrend line with overtaken 50 MA. Silver stocks were thrown away in this Deflation Fear and once Greed will brighten the day they will show dramatic rise again. 1. Low yield will bring more lemmings into the Bear Trap of Treasury Bubble and US Corp will sell debt to third parties to finance bailouts. 2. 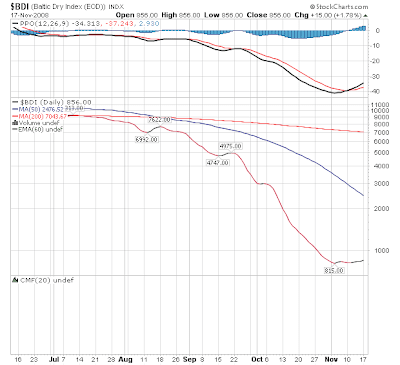 Low yield will push money into other assets to finish Deflation death circle with forced selling and collapsing prices. 3. Results will be lower US Dollar and Inflation most desired outcome. Hold onto your Gold and Silver pennies left. Saving the CITI Group has put last nail into Deflation camp: banks will not be allowed to fail any more. VIX has made a Double Top stronger reversal pattern confirmed yesterday's action. Please see our comments on US Dollar and Dow about recent new weapon employed by FED - Quantitative Easing by way of issuing new money and buying Treasuries or other securities in the open market. US dollar is screaming please let me go down and save you all from Depression. Most benefit will come to emerging markets and Canada's venture stocks which were devastated by Fear and forced selling. Greed is coming back and money guys will start to chase performance again. Debasing dollar, falling Treasuries yields are pushing money into the markets. This is the only cure to break the death spiral of falling assets prices in depression. Welcome Inflation. If markets will be able to make third day in a row into positive close technical break out will be very significant. 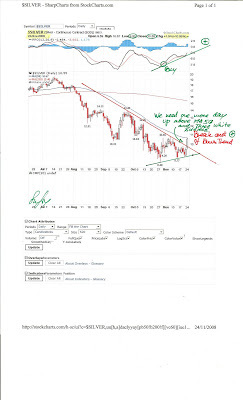 US Dollar needs to break down below 85 for a definite move confirmation. This morning with new 800 billion bailouts plan US Dollar is slipping down and Treasuries are rising all across the maturity: FED has started Quantitative Easing? Watch the Gold, its move last week was footprints of those in the know about coming bold moves on debasing US currency. Now finally everything is coming into place: Mr Obama's lets fight Depression and Total collapse and worry about deficit later if we succeed. TNR Gold Corp ("TNR") is pleased to provide assay results from 7 diamond drill holes of the 2008 exploration program on its 100% owned El Salto project in Argentina. TNR drilled 12 exploratory drill holes, totalling 6446.45 metres, to evaluate a copper-molybdenum-gold porphyry system on this underexplored property.Of the 12 drill holes (ES07-01 and ES08-02 to ES-08-12), 8 holes were drilled in the north-western (ES07-01, ES08-02, 03, 04, 07, 10, 11 and 12), and two holes each in the central (ES08-05 and 06) and south-eastern (ES08-08 and 09) parts of the property. These holes targeted a large (4.8 km long and up to 1.3 km wide) IP chargeability anomaly extending from the northwest to southeast end of the property. This anomaly corresponds very well with a distinctive alteration system (largely phyllic with local potassic and silica alteration), and is also partially coincident with geochemical anomalies (copper and molybdenum) delineated during the reconnaissance program in the 2006 and 2007 field season.Of the 8 drill holes (3,690.55m) that tested the north-western property, 6 holes were located in a stockwork-breccia area. Assay results currently available show copper values exceeding 500ppm (0.05%) in samples from all 6 holes, anomalous molybdenum and, in some instances, gold associated with copper mineralization.The two drill holes (ES08-08 and 09) in the south-eastern part of the property intersected anomalous copper and molybdenum throughout but yielded no intercepts of economic significance." Nov. 24 (Bloomberg) -- Copper, headed for its biggest annual price drop in at least two decades, will rebound as demand grows and mine output drops, Freeport-McMoRan Copper & Gold Inc. Chief Executive Officer Richard Adkerson said. I did not notice any Reserves of this magnitude in FED's balance sheet recently for this kind of shopping spree. So the money will come from issuing new debt by selling treasuries and plain vanilla printing money. In "normal economy" if corporation is taking more debt to buy assets which nobody wants in the market, issuing new shares in order to buy the same low quality assets, losing its revenues in the form of taxes because of recessions its shares will go down. US Corp. manage from July to prove otherwise, its shares US Dollar was going up in value against almost all other currencies and its Debt was selling like hot potatoes in a cold day. I will say just five the most dangerous words in investment: "This time it is different". It was "different" before with Google GOOG, Subprime, All banks and markets DIA, SPY, QQQQ, but only for a little while and then reality has stricken deadly. It will be the same this time with US Dollar and Treasuries Bubble, the higher they go the faster they will fall back to reality. "Nov. 24 (Bloomberg) -- The U.S. government is prepared to lend more than $7.4 trillion on behalf of American taxpayers, or half the value of everything produced in the nation last year, to rescue the financial system since the credit markets seized up 15 months ago. Most of the spending programs are run out of the New York Fed, whose president, Timothy Geithner, is said to be President- elect Barack Obama’s choice to be Treasury Secretary." We know what the "New" guy is going to do: Reinflate, money, garantees...everything...Gold will give an answer. Gold Miners GDX are in a Break Out. After months of suppression with all broader equities Gold Miners GDX suddenly remembered on Friday that they have been waiting all these years for Disaster to come and to be a protection, store of value and even new wealth creation in times of Debasing of Empire and its currency US Dollar. 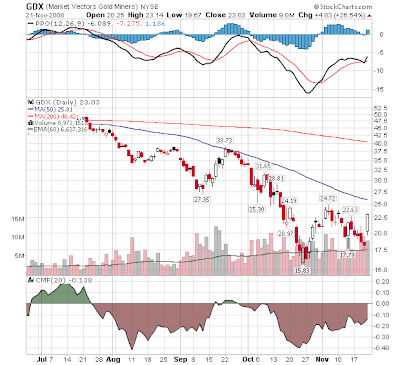 GDX has rallied 27% on Friday. What happened? We have discussed already that Gold is screaming on its charts. Gold Miners have rallied Friday even with US Dollar flirting with new highs. 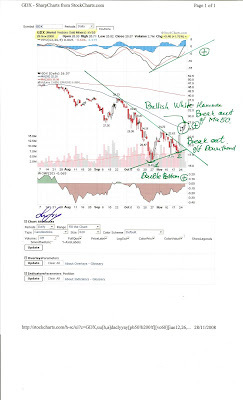 Downtrend line is broken to the upside and potential overtake of MA50 is in the picture. Largest Gold producer Barrick Gold ABX has rallied more then 30% in one day. We are closer to a point when direction of US market will be irrelivant for Gold miners or even better: its dimise will fuel rise in Gold, Silver and Miniers. Because of artificial US Dollar rally and pending collapse of Treasury Bubble Gold is positioned to overtake recent highs in a very bold action and fuel new rally in its Miners. Watch further developments in Royal Gold RGLD early warning Gold indicator of future move. Total value of all mining companies represented by HUI Gold Bugs Index is still below 100 billion dollars, one Google GOOG was much bigger then total sector in its Happy days. We need just 1% of total value in equities to ignite the sector to the new highs. Recent Deflation Fear and following Deleveraging have damaged the sector, Supply side is struggling and Gap will be huge with rising Demand driving the prices Up. Situation with a small brother Silver will be even more explosive, with recent cuts in production in Zinc and Copper mines and hundreds of projects put on shelves Supply will never come at this price level as a majority of Silver is mined as a By Product of Zinc and Copper mines. GDX, SSRI, SLW, AUY, ABX, MGN, SST.v, OK.v, TNR.v, BVG.v, MAI.v. 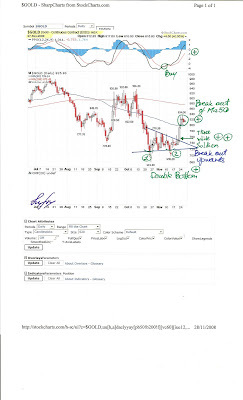 Mark Faber on Gold GDX, Equities and US Dollar. INTERNATIONAL. 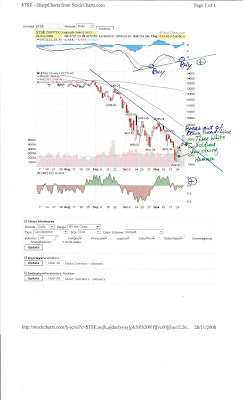 Speaking on CNBC Squawk Box Europe, Marc Faber the Swiss fund manager and Gloom Boom & Doom editor and publisher said on Fiday that asset markets are "terribly oversold" now, while investors are going overboard into the US dollar and US Treasuries. "What you could see in the next three months is a very strong rebound in asset markets, in equities, followed by a selloff in bonds and eventually a selloff in the dollar," he said. "I still like gold," Faber said, because it is cash and not the liability of someone else. He however warned the assets that held up very well in the current crisis may not perform well near term. "If we get a rebound in equities, it is conceivable that people will sell assets that held up well and try to put their money in distressed assets,' he said. “Gold price could easily drop to US$700 per ounce before it enters into a rise but one will see much higher gold prices eventually because paper money is over time losing its purchasing powers in the world. It’s very clear that every currency is losing its purchasing power in the world", Faber told India's CNBC-TV18 last month. Faber also believes that the gold mining exploration sector is extremely at depressed levels and even if gold falls, gold mining exploration companies will go up. Governments and central banks around the world are providing liquidity and that will eventually have an impact, Faber said. And once the buying starts the rally is likely to be "stronger than people expect" given that financial institutions are sitting on so much cash, he added. "I think the intervention by the government in the past and at the present time has created more volatility, not less, and so right now we have deflation, we have colossal deflation in asset prices," he told , noting that equities alone have lost US$30 trillion globally. The Gloom Boom & Doom editor warned that if markets remained down for a longer perid, the current crisis may end up being worst than the 1929 depression. Statistically a rebound should happen, but if it doesn't "the air is out" and the world faces an economy "worse than the depression of '29 to '32," he said. Gold can not keep it quiet any more. On Friday it screamed loud and clear that Deflation, US Dollar and Treasury Bubble are jokes all along with implied Zero rate returns on maturities up to One Year. With all automakers on the wedge of collapse GM F, with second biggest bank CitiCorp C at near life support machine who is buying all this crap? Answer could be even more close to you then you think. One of the monetary tools of the Fed at near Zero rate policy is Debt Monetisation when FED is buying Treasuries all across the maturity and bringing more lemmings into the game of momentum play. It was always a mystery for me how could you finance all those bailouts without US Dollar total collapse? Before China will produce Goods, get dollars for it and happily buys Treasuries to finance US Corp. With import plummeting (including with payments for Oil to Middle East and others) foreign buyers do not have any more dollars and hunger to buy more and more debt. Even worse for Mr Paulson and Co - China started to talk about buying Gold and investing in its own country Infrastracture, Russia is struggling with falling oil, selling USA Agencies Debt and is buying Russian Equites. Saudis are still trying to figure out why they pushed the oil down with only to have the wrong guy in the office and are buying gold as well. Saudi Arabia buys $3.5bn of gold in two weeks I guess they know thing or two about how much Oil is really left in their ground. All those deleveraging is a valid idea up to the point and that point is: if your bank is stable you do not have to buy Treasuries at Zero rate. I will not be surprised that all that Quantitative Easing is already happening and FED is printing money and buying Treasuries all across maturity. It is a very fine balance game: if you can increase sales of treasuries to other buyers you can try to fill liquidity gap at low rates before market will figure it out and demand higher yield for debasing currency. Two weeks ago one of the auctions of 30 years Treasuries failed because of low yield. Last week we had those fireworks with all yield collapsing. Gold has kissed MA50. If Gold market is telling us that these ideas are valid it will play levels 800, 820, 840 and 860 before breaking out of MA200 which will be bullish confirmation on weekly chart. Very interesting chart: with recent meltdown in DOW DIA, S&P SPY and Nasdaq QQQQ and new lower lows Chinese ETF FXI managed to make a higher low and formed strong reversal pattern with Buy not violated on PPO as in a more cautious case in Dow. Next week will be crucial whether FXI can overtake resistance of MA50. 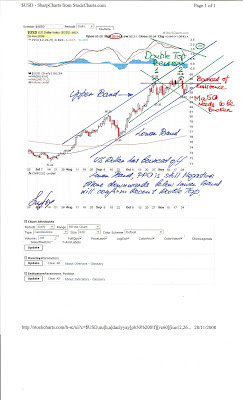 US Dollar looks Exhausted to Rise on Fear, Bearish Rising Wedge Reversal is in the making? US Dollar looks Exhausted to Rise on Fear, Bearish Rising Wedge Reversal is in the making? 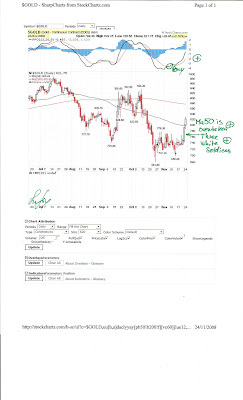 Last Thursday when Dow DIA H&S reversal was violated and waterfall started, US Dollar broke out Up of Double Top Reversal, but failed to make a definite High confirmed by Buy crossover in PPO. Hell broke lose after Mr. Paulson opened his mouth again. Jim Paplava has interesting theory that this is his intention: to drive lemmings into Treasuries in order to secure financing for all bailouts. "The Federal Reserve’s balance sheet has ballooned from $900 billion to more than $1.8 trillion. That’s 13% of GDP. The Treasury Department has telegraphed its intention to float $550 billion of debt in the fourth quarter and estimates it will have to float another $368 billion in the first quarter of 2009. Our national debt will then be close to 49% of GDP." Nothing is certain apart from uncertainty nowadays, but US Dollar looks very exhausted on its chart. It has push up from Double Top formation refusing to Sell off on markets continued turmoil and Fear, but now is in a potential Rising Wedge formation with PPO still in a down trend pointing to lower resolution. Again TA only works for those who are making money and never does for those who can not. If CitiCorp C will not be bail out this weekend in one form or another waterfall in markets could bring Fear back and US Dollar will Break Up. But formation is very favorable for the best outcome for Treasury: Market up DOW DIA in a Bullish Engulfing candles pattern, Fear down VIX came into Double Top stronger reversal pattern, US Dollar is weaker resolving downwards from rising Wedge. Inflation is welcome back, deflation Monster is going out of the picture. Last Friday Gold action could point to this resolution. Gold market is too small to accommodate all money running out of Treasuries when prices will go down from recent Top with almost Zero interest on up to 1 year papers. Manageable debasing of US Dollar will be in the picture back, wrong perception of Deflationary scenario in the Treasuries market will allow to sell US Corp. more Debt at lower prices then was imaginable before, but all this Flood will make this Bubble the biggest to fall so far. 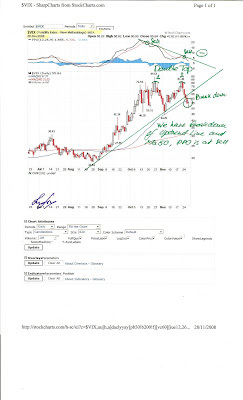 Gold will go higher recent highs and Silver will be in a parabolic move again. Gold is up 7.7% 57 to 801 USD, is China already buying it? China PBOC Mulls Raising Gold Reserve By 4,000 Tons - Report BEIJING (Dow Jones)--China's central bank is considering raising its gold reserve by 4,000 metric tons from 600 tons to diversify risks brought by the country's huge foreign exchange reserves, the Guangzhou Daily reported, citing unnamed industry people in Hong Kong. The Guangzhou-based newspaper didn't elaborate on the plan. China's forex reserves, at US$1.9056 trillion at the end of September, is the world's largest. U.S. dollar-denominated assets, including U.S. treasury bonds and mortgage agency bonds, account for a big proportion of the forex reserves. Google GOOG Below 250 USD intraday! Dow plus 500 points Rally, Gold at 800! Time when the prediction was made that Google could deep below 250 in a severe Bear market valuation passed in our memory as so distant and happy that it is almost not worth mentioning. But the call was done and was right on the money. Other observations could come into life with recent developments. Announcement about the new Head of Treasury fired the rally in the market. Yesterday all hope was lost: VIX made break up, DOW has violated Bearish Flag downwards and US Dollar almost broke up to upside. Today was the different story and first Gold start to rally and overtake very important resistances on the way to 800. HUI, GDX and all Goldies have followed in unison with gains up to 31% in Barrick Gold ABX. Is it a turning point? Very much could be: in DOW we have a Bullish Engulfing Reversal candle pattern, last capitulation could exhaust the market pretty much and they should do something over the week end to fix the situation with CITIGroup C. The most important is that gold rallied even with still rising US Dollar and maybe our endless battle with gravity is over. Goldies in HUI and GDX have formed very strong reversal and never retest the lows in recent sell off it could be very strong positive divergence from the general market which is in play again. 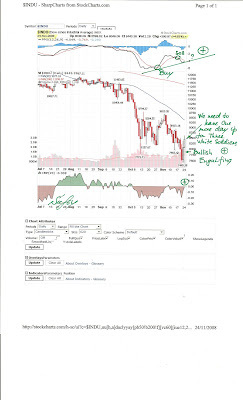 So we can forget charting miserable destiny of financials in the DOW and concentrate back on our Bull in Gold, Silver and Commodities ones investors will come back to their common senses. With the new guy in charge in Treasury we can expect understanding of the currency question and that the strong dollar will kill economy in Deflation spiral. Weak US Dollar is the medicine from this meltdown. Shorts will be served Fried next week particularly in Gold and Silver and their producers Shares. 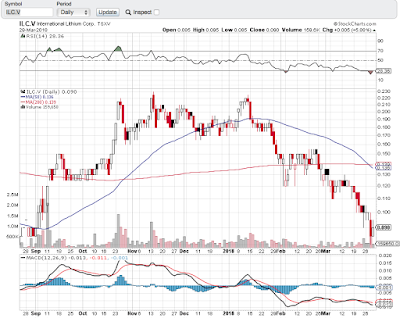 We have here a Buy crossover on PPO from extremely oversold level. We have already discuss the theory that Credit Crunch could overstated the real danger of down turn in Real economy in China and Asia. Trade is based on Credit facilities and if you can not secure Letter of Credit for your trade operations Trade is just do not happen. With all that flood of liquidity making its way into system recovery could be not so far away in commodities. China stimulus package is a Major turning point here as well. Ben and Hank will talk today on the Hill, before every time they have testified markets were selling off. Will they make it different this morning? Nothing sensible came out of G20. One thing which can not be announced, but be done: intervention in open markets to weaken the US Dollar. Today at 6 am Pound and Euro have took off and continue to rise all trading day until close of Wall Street. Rally against the dollar were not spoiled even by markets going down. Tomorrow we will have more signs whether it is our Bold decision of G20. 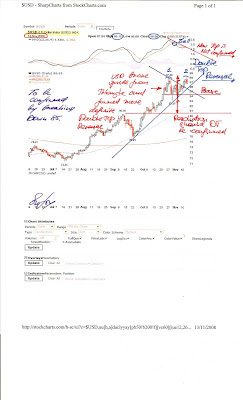 All indicators are at cross roads: US Dollar is ready to break down, but needs a push - risk is an assending triangle with upside break out if Double Top will not be confirmed; DOW DIA held closing Low of last Reversal day, needs to push up; VIX formed Dragonfly Doji, could be a strong reversal in the forming right shoulder - needs push down. Lost chance now will cost dearly everybody in the markets and US economy. US Dollar Last Wish and Favor to the World. Gold, Silver, GDX, SSRI, SLW, AUY. This is the number one in all our analyses. US dollar last wish is to save US Corp. Without US Corp. it will be out of existence. Please check two previous charts why it is so important now. US dollar last favor to the new world - is to go down now, next week. Stronger dollar is a Deflation Monster, killing the US Economy and taking down world economy with it. Those with higher Debt are in the worst shape in deflation: real money repayed back are Increasing in value! US Corp is the Victim here. Inflation is the only way out. There is a chance to save US Corp. - it will never be an Empire again and it does not need to be any more. With new energy it could come back leaner, wiser and stronger eventually. Action is needed this weekend to help the dollar go down. Coordinated Cut which could be announced and Intervention in the Forex in Yen and US Dollar. Agreement could be cut and China could agree to manageable debasing of USD: everything is ready. US Dollar is at the Double Top, one definite action and it will break down. 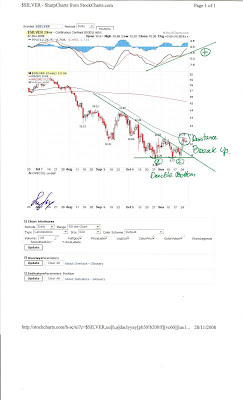 With weaker dollar we will have tectonic shift in Inflation expectations. With near zero short rates managed by FED and falling dollar long term rates in the form of Treasury Yield will go Up. Banks will be able to function and earn on their lending. With rising assets prices, fear will subside and greed will return back with changing perception of lost performance, all money on the sidelines will chase it again. Weak dollar - Lending recover - Velocity is Up - Inflation - Rising assets prices - Less redemptions - Less margin calls - No fire sells - Back to fundamentals - Debt is going down in real terms - Liabilities of US Corp to subjects are going down in real terms - Derivatives on the End of the world outcome are becoming worthless and could be isolated - Export is Up supporting economy with struggling consumer - Tax returns are up with inflation - Housing will bottom at lower level in nominal value (do not ask me about real value). Survival. So where is out bottleneck for all those trillions and worthless money - as usual: Gold, Silver, Commodities. First time in this game for 7 years our interests aligned: FED should even Buy some Gold to push it up to 1000 to show that Inflation and not Deflation is coming. Will we get at least something of what we are talking here about: charts are telling that everything is ready, players have made their moves and we can see their footprints, tons of money will be made as usual by those in the know, but it is the only chance to save the world from lost decade Japan style. 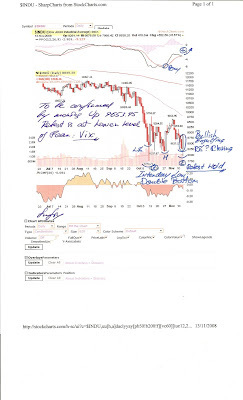 We have a very good picture confirming Bullish Reversal in Dow DIA: fear index VIX is forming a Bearish reversal with potential resolution Down. Dow retest of Low happen with less amount of Fear: market participants were ready to pay less premium for Put protection and Volatility expectation is going Down. For a definite move in the Dow from deflation to positive Inflation outcome next weak Rally must be fueled by this weekend action on key to all things now US Dollar. Fed is fighting Japan style Deflation and flooding the system with the money, in order that all these flood came into real economy you need to return normal velocity of money. 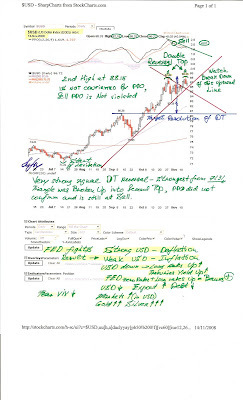 Fear and panic is leading to Fire Sell, downward spiral in markets with Dow as indicator is leading to further margin calls, redemption and Risk not taking. Money are stashed at the Fed on banks accounts. Spiral became self reinforcing: panic - fire sell - prices down - more panic etc. Fed can not leave it to "effective market" any more. There is no such thing with Fed in existence and more practical importance is that all economy will be killed by derivatives, Lehman was a turning point which showed that collapse will take down all financial system. Everything is on the table now: turn markets into Inflation expectations and try to liquidate all "bad derivative positions". If velocity will not be returned now in the form of Weaker US Dollar, higher Long term Yield which will lead to steeper curve and Banks ability to make money by lending, Flood will eventually happen, but too late and with much more water when all economy will be submerged under hyperinflation. This money creation and record deficits for years to come already making all things are hardly manageable in US Corp. But there is a chance and it must be taken. 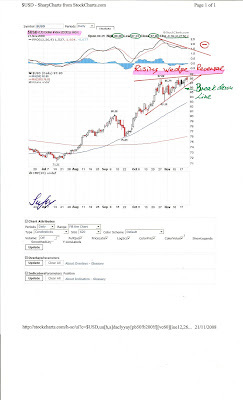 Please follow to Us Dollar chart. DOW DIA is at a very important H&S Reversal point, time for Action. CS, FXI, EWZ, GDX. We can see from the chart that we are half way there: saving the world from Deflation spiral Japan style for the next 10 years. Bold action is needed now over this weekend to kill the Fear, confirm H&S Reversal squared by Intraday Double Bottom. Dow must overtake 9653.95 on weekly close to diminish Bearish Flag. If not, we will have a waterfall, further assets fire sell and self reinforcing deflation spiral. Dow for us here is only a reference point, but very important now: it is showing whether FED efforts reinflating economy are working or not. Deflation will be forgotten in two weeks after move above 10000. But action needed now. All reinflation efforts are leading to "liquidity trap" if velocity of money is falling of the cliff: banks are not taking any risk and just keeping money at the FED. The key to all is US Dollar: it must be weaken immediately and everything is ready for it: just one push and world will be saved from Deflation Monster. We will refer to further charts on what must be done. As we have discussed Dow Low Retest and VIX picture are giving a good chance to Form powerful Reversal in US Dollar - Double Top. Everybody needs a weaker dollar, it is time to remember old word - Inflation. Nobody wants 30 year Treasuries at Yield below 5% - if it is a surprise it is not on this blog for sure. Nov. 13 (Bloomberg) -- Treasuries fell, led by 30-year bonds, after investors shunned the government's $10 billion sale of the securities amid concern that U.S. debt sales will grow. The bonds drew a yield about 9 basis points above the level in pre-auction trading. At 4.31 percent, it was still the lowest since regular sales of the security began in 1977. Investors have been favoring shorter-term debt, which serves as a haven in times of turmoil and a bet the Federal Reserve will lower interest rates. The U.S. sold $34 billion in four-week bills yesterday at the lowest rate on record. The yield on the 30-year bond climbed 18 basis points, or 0.18 percentage point, the most since Sept. 30, to 4.35 percent at 4:17 p.m. in New York, according to BGCantor Market Data. The 4.5 percent security due in May 2038 plunged 3 1/32, or $30.31 per $1,000 face amount, to 102 1/2. Ten-year note yields increased 13 basis points, the most since Oct. 28, to 3.87 percent. The two-year note's yield rose 8 basis points, the most in three weeks, to 1.24 percent. The rate on the one-month bill was 0.05 percent, near yesterday's record low. The bond auction followed yesterday's sale of $20 billion in 10-year notes. The $30 billion total of the two auctions is the biggest amount of the securities sold in a week since at least 1990, when Bloomberg began tracking the data. The gap between yields on two- and 10-year government notes widened to 2.64 percentage points, the largest since October 2003. Traders yesterday pushed two-year note yields to the lowest level in five years, while the Treasury's sale of $25 billion of three-year notes on Nov. 10 attracted the highest level of investor bids relative to the amount offered since 1998. Today's bond auction forecast to draw a yield of 4.224 percent, according to the average estimate of seven bond-trading firms surveyed by Bloomberg News. The bid-to-cover ratio, which gauges demand by comparing the number of bids to the amount of securities sold, was 2.07, below the average of 2.19 times in the nine auctions since the bond was revived in 2006. Indirect bidders, a class of investors that includes foreign central banks, bought 18 percent of the securities offered, down from 43 percent at the last sale. The sale was a reopening, meaning the bonds pay interest at the same rate and mature on the same date as those in the August auction. They mature in May 2038. Futures on the Chicago Board of Trade show an 80 percent chance the Fed will lower its 1 percent target rate for overnight bank lending by a half-percentage point at its Dec. 16 meeting. The odds were 58 percent a week ago. The difference between what banks and the Treasury pay to borrow money for three months, the so-called TED spread, was 1.96 percentage points, compared with 4.57 percentage points a month ago. The federal budget deficit in October, the first month of fiscal 2009, climbed to a record $237.2 billion, spurred by U.S. purchases of stakes in some of the country's largest banks. It exceeded the budget shortfall for President George W. Bush's first full year in office. Banks and securities companies globally have reported almost $1 trillion of losses and writedowns tied to a meltdown in the credit markets since the start of 2007. The U.S., Japan, the U.K. and the euro region are headed for their first simultaneous recessions since World War II, according to the International Monetary Fund. Initial claims for U.S. unemployment insurance rose last week to the highest level since September 2001, when the economy was last in a recession. They increased to a larger-than- forecast 516,000 in the week ended Nov. 8, from a revised 484,000 the prior week, the Labor Department said today in Washington. To contact the reporter on this story: Cordell Eddings in New York at ceddings@bloomberg.net; Sandra Hernandez in New York at shernandez4@bloomberg.net." Fear Index VIX is staging reversal after Dow Low Retest. Fear as a very strong Emotion and you can not be at Ultimate Panic Stage for a long time. 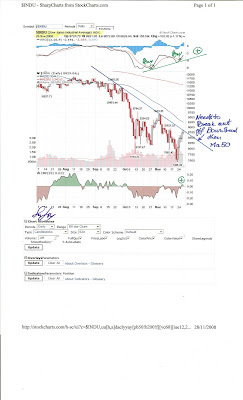 Stupidity is another story, and you my dear friend are the best to know it...We have made Low High on Dow Low Retest and it is a very positive observation. After brutal Sell off with unprecedented speed of decline we are back into chartered waters: public knows now that we can anticipate powerful Rally and started position itself today selling treasuries all across the maturity. Fear will subside and Greed will be chasing performance again. 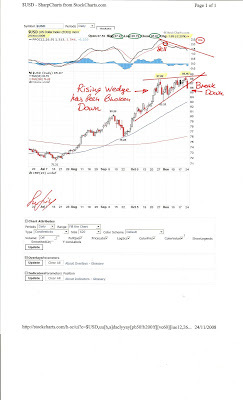 Once Fear will stop spinning heads around double Top on US Dollar chart will be a very good reason to address fundamentals of the "safe heaven" currency, backed by One Trillion deficit. I hope I will not spoil it...In the beginning of the day Bottom seems to be falling off with the last Hope. News are all Negative and the last faith is lost. I guess it is how Mr Market is testing us. Another important observation: Who is leading Whom - China was up more then 4% after its more in Depth Stimulus Package appreciation and today we have experienced Powerful Retest of Low. All three major Charts has been alligned today: Dow restest of the Low, Fear VIX made lower high on this Retest and USD has made Second High forming Double Top. Everything is ready for transition: Fear for what has been left of your Capital to Greed and chasing perfomance. Dow is only the refference point for us - our heart belong to another tangible Things which are Nessesary as always. We were worring about mere existence of the Financial System, then Currencies and now Deflation. Time is to stop worry, let FED fight Deflation and position our pennies for Inflation Tide. 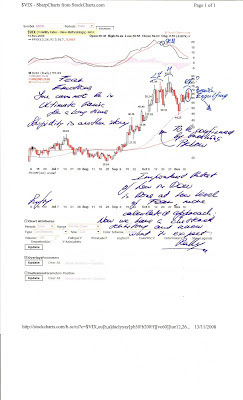 Technical Analyses is never a pure scince and is only a way of Meditation on the Way of Things. It only works for those who are making money and it never works for those who are losing. I do not know what kind of fundamental shift it is Painting for us today: news are awful, "deflation is everywhere" and no Hope left for our Gold, Silver and Commodities Bull. But there is a Knowledge in the Market and those who know are leaving their footprints. We mere mortals can not call to Hank or Ben, but some others can...They are making money and we can see it on the picture. Trends are Bigger then Life and money involved are Big, so we can try to make our small stake on it: following the major Trend - Debasing of the former Empire currency. One of the "unknown" fundamentals TA is telling us now could be coordinated action after 15th of November with Rates Cut and weakening US Dollar policies - Quantitative Easing is all over mind those in power now. Trade will be made to prevent the collapse and allow orderly decline of the currency to stimulate Export and bring Inflation back. Fingers Crossed: Retest in Dow - US Dollar: gravity is back. Markets are bigger then we can appreciate it, with never ending bad news we have retested today the Low and formed a stronger reversal pattern. US Dollar has broke from triangle and killing all hopes for Gold and Commodities made a new High. Stronger Reversal pattern has been formed as a Double Top: aligned with retest in Dow, Falling Fear and its measure VIX, retest of 700 in Gold we have very good chances for US Dollar levitation coming to an END. Charts to follow. Never say never...but Sun is coming back to Rise from the East. "Nov. 12 (Bloomberg) -- China's retail sales rose 22 percent, close to the fastest pace in nine years, signaling that domestic demand may help the fourth-biggest economy withstand a looming global recession. Sales climbed to 1.008 trillion yuan ($148 billion) in October, the statistics bureau said today, after gaining 23.2 percent in September from a year earlier. The increase matched the median estimate of 16 economists surveyed by Bloomberg News. China's government pledged $586 billion of spending on low-cost housing and infrastructure on Nov. 9, seeking to boost confidence as the economy loses steam. Waning export demand and slumping real-estate sales threaten to undermine growth that has already slowed to the weakest pace in more than five years. The benchmark CSI 300 Index of shares closed 1.2 percent higher. The yuan rose to 6.8285 against the dollar as of 3:58 p.m. in Shanghai from 6.8305 before the announcement. Automobile sales climbed 19.6 percent in October from a year earlier, boosting the Chinese ventures of Volkswagen AG and General Motors Corp. Jewelry rose 30.6 percent. Signs of weakness included slower sales growth across sporting goods, cosmetics, jewelry, furniture, garments and food. Spending on telecommunications equipment and construction and decorating materials fell. Household electronics rose only 0.8 percent after a 30.3 percent gain in September. ``Stiff headwinds are ahead and we expect a slowdown in retail sales growth in coming months,'' said Merrill Lynch & Co.'s Hong Kong-based economists Ting Lu and T.J. Bond. Ha Jiming, chief economist at China International Capital Corp. in Beijing, said the retail figures were inconsistent with evidence that growth in household spending had already weakened. Rural sales helped to underpin today's figure, accelerating to growth of 21.9 percent from 21.8 percent in September. For urban spending, the gain was 22.1 percent, down from 23.9 percent. China's economy expanded 9 percent in the third quarter from a year earlier, the slowest pace since 2003. Falling demand for real estate is undermining investment and construction. In Shenzhen, a manufacturing and exporting hub on the nation's east coast, house prices declined 12.6 percent last month from a year earlier. Inflation has halved from a 12-year high of 8.7 percent in February. Exports grew by the least in four months in October and manufacturing contracted by a record. The benchmark CSI 300 Index of shares has dropped 67 percent this year. Wage gains may sustain spending. Urban disposable incomes climbed 7.5 percent in the first nine months of 2008 from a year earlier, after adjusting for inflation. Rural incomes climbed 11 percent. PepsiCo Inc., the world's largest snack maker, said this month that it plans to invest $1 billion in China in the next four years to increase production and sales. The stimulus package, running through 2010, includes housing, rural infrastructure, railways, roads, airports, tax cuts for business investment and subsidies for farmers. The central bank has already lowered interest rates three times in two months and reduced restrictions on lending to stimulate growth. The key one-year lending rate is 6.66 percent. For the first 10 months, retail sales climbed 22 percent from a year earlier to 8.8 trillion yuan, the statistics bureau said. That was up from 16.8 percent for all of 2007. In the first half, consumption contributed 50.2 percent of the nation's economic growth, investment 44.9 percent and net exports 4.9 percent. Last year, net exports accounted for 21.5 percent. The biggest gain in China's retail sales since Bloomberg data began in 1999 was a jump of 23.3 percent in July this year. To contact the reporter on this story: Nipa Piboontanasawat in Hong Kong at npiboontanas@bloomberg.net "
China is still growing, Export up 19% in October. Rate of growth is lower then in September at 21.5%, but remembering the total Credit Crunch in Trade and general mood in the markets in October it is great news for that part of the world. BEIJING (AP) — China's trade surplus swelled in October to a monthly record but export growth weakened amid a global economic slowdown that has battered Chinese exporters, according to data reported Tuesday. China's global trade surplus rose 30 percent from the year-earlier period to $35.2 billion, the customs agency reported. The surplus with the United States rose 13.6 percent to $17.5 billion, while that with Europe rose 12.2 percent to $15.6 billion. Exports surged 19.1 percent to $128.3 billion in October despite weaker global consumer demand. But that growth rate was down from September's 21.5 percent and sharply lower than the recent peak of 26.9 percent in July. "The global financial crisis has had a considerable impact on Chinas export growth, which will continue to show weakness with recession in the U.S. and Europe," said a report by Jing Ulrich, JP Morgan & Co.'s chairwoman for China equities. An unexpectedly sharp downturn in foreign demand for Chinese goods has led to a wave of factory closures and layoffs in the country's export-driven southeast. The government has tried to help struggling exporters by boosting export-related tax rebates. Its massive stimulus package unveiled Sunday calls for efforts to compensate for weakening foreign demand by boosting domestic consumer spending. China's import growth fell even more sharply in October, widening the trade surplus and reflecting weakness in domestic demand. Imports rose 12.4 percent to $93.1 billion, compared with September's 21.3 percent growth rate." Interesting US Dollar has manage to close Up today and formed "the hanging man", normally it will be a reversal pattern within our Triangle pointing to resolution downwards. Markets were under pressure in US even after Chinese stimulus package, very interesting divergence has formed when Gold and Silver manage to close positive after so custom selling pressure in New York session. Night and Morning Asia is Buying and during the day West is selling. Not today and Goldies have rallied closing strongly on positive side. Is it another sign that Us Dollar levitation magic is over? 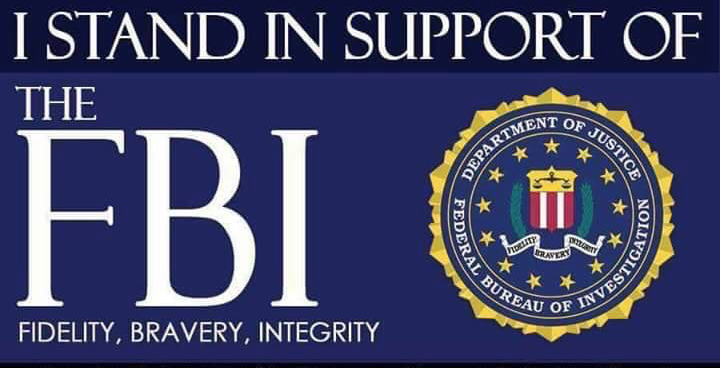 We will find it out very shortly. 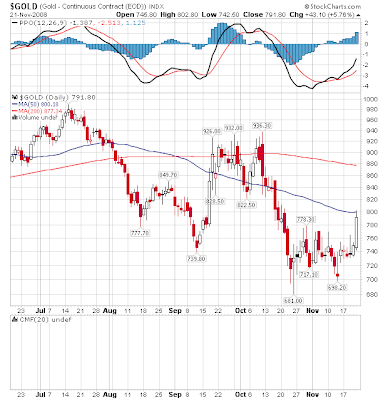 US Dollar Risk Averse Trade is close to an End? China FXI - it is still there and growing. Gold Miners GDX H&S Bullish reversal. Basic Materials is coming back.